The following is a lightly edited version of a speech I gave on March 1 st in Washington during the anti-AIPAC and Netanyahu visit demonstrations. Two days later Israeli Hollywood producer Arnon Milchan, whom I cite below, was sitting in the House VIP visitors’ gallery beaming as he listened to Netanyahu’s love fest with Congress. It might have been the first time a clandestine agent for a foreign country who spied on the United States was so honored but I would observe that the event was doubly significant in that the speaker Prime Minister Netanyahu was also involved in the same theft of American nuclear technology. Miko Peled is well worth hearing and many of the questions are very interesting, revealing the depth of revulsion for AIPAC and all its works. I would like to concentrate on two issues. First is the nature of the special relationship between Israel and the United States and second is the role of the Israel Lobby and most particularly AIPAC in shaping that relationship. I was a foreign policy adviser for Ron Paul in 2008 and consider myself politically conservative. I respect the fact that nations must be responsive to their interests, but because of my personal experience of living and working overseas for many years I have come to recognize that the United States is an anomaly in that it persists in going around the world doing things that just do not make any sense. This has been particularly true during the past fourteen years, with invasions, interventions and targeted assassinations having become the preferred form of international discourse for Washington. Many would agree with what I have just observed, but few recognize the role of the special relationship with Israel in shaping what the United States has become. Quite frankly, the relationship is both lopsided in terms of favoring perceived Israeli interests as well as being terrible for the long suffering Palestinians, very bad for the United States as it damages the American brand worldwide and even bad for Israel as it enables its governments to act in ways that are ill advised and ultimately self-defeating. I would first like to address the often repeated mantra that Israel is America’s best friend or closest ally as it is a bedrock issue that is frequently trotted out to excuse behavior that would otherwise be incomprehensible. Apart from being a recipient of more than $3 billion per year from the US taxpayer, Israel is no ally and never has been. There is no alliance of any kind with Israel, in part because Israel has a border that has been moving eastward for the past fifty years as it continues to absorb Palestinian land. Without an internationally recognized border it is impossible to define a relationship between two nations. Israel also has no strategic value to the United States, so to speak of an alliance, which posits reciprocity is ridiculous. But that is not to say that Israel does not interact with Washington. Indeed, some might say that it is possesses a disproportionate voice relating to some foreign and domestic policies. The penchant to use force as a first option in international interactions is perhaps itself due to Washington imitating Tel Aviv or vice versa as neither the United States nor Israel seems any longer interested in diplomacy. American protection of Israel in international bodies like the United Nations is a disgrace, making the United States de facto complicit in Israeli violations of international law, to include its settlement expansion, as well as its war crimes. Under Bill Clinton the United States more or less adopted the Israeli model in dealing with terrorism, which consists of overwhelming armed response and no negotiations ever. Washington’s uncritical support for Israel politically and militarily was a major factor in motivating the perpetrators of the 9/11 terror attack. Deferring to Israel often results in U.S. policies that are absurd and highly damaging to other interests. Secretary of State Condoleezza Rice described Israel’s devastation of Lebanon in 2006 in which nearly 1,000 civilians were killed and more than $2 billion in infrastructure was destroyed as the “birth pangs of a new Middle East” Rice, who also spoke of fear of a nuclear mushroom cloud rising above Washington to justify invading Iraq, far from being discredited due to her lack of discernment, is currently a professor at Stanford University and is now being spoken of as a possible Senator from California or, alternatively, as the next Commissioner of the National Football League. So much for accountability in the United States. One might well conclude that Israel is not only not an ally but also not much of a friend. It has run massive spying operations inside the United States to include hundreds of Art Students and celebrations by the employees of an Israeli moving firm located in New Jersey when the twin towers were going down. Israel is regularly named by the FBI as the most active friendly country in terms of running espionage operations against the U.S. but nothing ever happens. Israeli spies are sent home quietly and Americans who spy for Israel are rarely prosecuted. Last year we witnessed Hollywood producer and Israeli citizen Arnon Milchan receiving an Oscar even as stories were circulating about his criminal collusion to obtain restricted American technology to enable Israel to build nuclear weapons. The Justice Department has not seen fit to do anything about him. Israel also has a hand in what is going on domestically in the United States. Many states now have their own departments of homeland security and many of the companies that obtain contracts to provide security services are Israeli. Airport security is a virtual Israeli monopoly. Increasingly militarized American police officers now use federal government grants to travel to Israel for training based on the Israeli experience with the Palestinians. Israelis have advised CIA and Pentagon torturers and Israeli advisers were also present at Abu Ghraib. Israel’s influence over Washington policies frequently means war. American officials extremely close to the Israeli government were behind the rush to war with Iraq. If the Washington goes to war with Iran in the near future it will not be because Tehran actually threatens America, it will be because Israel and its powerful lobby in the U.S. have succeeded in creating an essentially false case to mandate such action. Congress is obligingly advancing legislation that would commit the United States to intervene militarily in support of a unilateral Israeli attack, meaning that Israel could easily be empowered to make the decision on whether or not the U.S. goes to war. Israel interferes in American elections, in 2012 on behalf of Mitt Romney, and also this week by aligning itself with the Republicans against the President of the United States to harden existing policy against Iran. Looking ahead to elections in 2016, two Jewish billionaires have already stated clearly that they will spend whatever they have to to elect the candidate that is best for Israel. As Sheldon Adelson is a Republican and Haim Saban is a Democrat both major parties are covered and I would warn “Watch out for Hillary,” Saban’s candidate of choice. Israel has corrupted our congress which we will witness again on Tuesday. Benjamin Netanyahu publicly rebukes and belittles our own head of state, its government ministers insult and ridicule John Kerry, and its intelligence officers have free access to Capitol Hill where they provide alarmist and inaccurate private briefings for American legislators. In short, Israel has no reluctance to use its enormous political and media clout in the US to pressure successive administrations to conform to its own foreign and security policy views. Beyond the corruption of our political process, I believe many in this room would agree that the depiction and treatment of the Palestinians has been disgraceful. Israel has engaged in land and water theft and is doing its best to make Palestinian life so miserable that they will all decide to leave. Some would describe that as ethnic cleansing. Just last week there were reports of how Israeli authorities cut off water and electricity to parts of the West bank and also won a bogus court case in New York City that will bankrupt the Palestinian authority. Netanyahu’s policy is to punish the Palestinians incessantly no matter what they do. The United States has certainly embraced a lot of unpleasant policies over the past fourteen years, but I honestly think that most Americans would be appalled if they knew how Palestinians really have been treated. Unfortunately the Israel propaganda machine has been able to maintain a tight grip on the narrative promoted in the mainstream media. Arabs are depicted as terrorists while Israelis are seen as folks just like us. How does all this happen? Because of money which enables the Israel firsters to control the media and buy the politicians, but unfortunately no one is allowed to say that lest Abe Foxman of the Anti Defamation League accuse one of propagating a stereotype that is an “anti-Semitic myth.” American media corporations and national politics are in fact totally corrupted by money and the control that it buys and not just on behalf of Israel. One would have to be blind not to recognize that fact. This is where groups like the American Israel Public Affairs Committee better known as AIPAC come in. 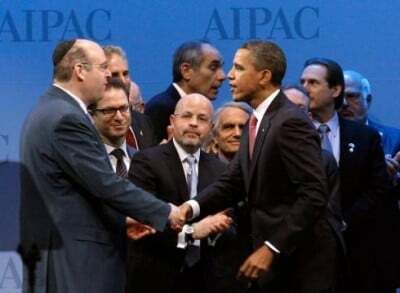 AIPAC is only one part of the octopus like Israel Lobby but it might well be regarded as the most effective component. AIPAC has an annual budget of $70 million and 200 full time employees. It has thousands of volunteers and tens of thousands of contributors and supporters, many of whom are in Washington right now. On Tuesday they will descend on Congressional offices to pressure congressmen to agree to conform to AIPAC talking points. AIPAC, which is an IRS 501(c)4 lobbying organization, is able to keep its donor list secret. It characteristically operates in the shadows. It prepares position papers that are then distributed in congress and many congressmen, largely ignorant of the issues, parrot what AIPAC gives them. AIPAC operative Steve Rosen once boasted that he could have the signatures of seventy Senators on a napkin in twenty-four hours. Congressmen know that crossing the Israeli Lobby is career damaging. Senators William Fulbright and Chuck Percy were among the first to feel its wrath when they were confronted by well-funded challengers backed by effective media campaigns who defeated them in spite of their own outstanding records as legislators. The founder of my own organization the Council for the National Interest Congressman Paul Findley also suffered the same fate when he fell afoul of the Lobby. Within the government the purge has also been widespread with the traditional Arabists at State Department forced out to be replaced by friends of Israel, many of whom have been political appointees rather than career diplomats. There is no easy solution to what I have been telling you. Certainly a more honest media would produce American voters who are better informed, but even though AIPAC has long been defending the indefensible the corruption in Congress runs deep and it is difficult to find a constituency anywhere in the United States where it is possible to vote for a candidate who is not openly and enthusiastically supportive of the Israel relationship. In Virginia last year there were several important congressional elections. All the candidates were vetted for their views on Israel well before the voting took place. But to return to AIPAC there should be demands that it and other similar Israel-advocacy organizations register under the Foreign Agents Registration Act of 1938. That would require them to have complete transparency in terms of their funding and it would also tell the American people that the organizations themselves are not necessarily benign and acting on behalf of U.S. interests, which is the subterfuge that they currently engage in. It is certainly past time to push back against an organization that is brazenly promoting the interests of a foreign government at the expense of the American people. Thank you.